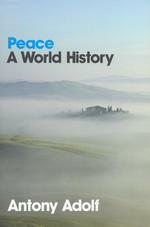 Is it possible to write the history of “peace” across the world since the dawn of humankind in 248 pages? Antony Adolf makes the attempt in his book ‘Peace: A World History’. Scholars of peace history normally limit their studies to manageable proportions, focusing on particular time periods, regions, events, movements, leaders, or theoretical approaches. Adolf, however, wants to convey the idea that peace is evolving in many forms and under many different circumstances. He thus avoids defining peace in conceptual terms. “A static definition of peace and peacemaking at the outset would be counterproductive to the comprehensive, concise and practical account of world history of peace I have striven for because definitions without contexts are half-empty glasses” (p. 4). Adolf does distinguish between peace within societies and peace between societies, and differentiates negative peace from positive peace, but these minimal definitions do not limit his scope. Adolf takes upon himself the impossible task of discussing all of the major developments of world history and all significant contributions to peace. The fact that his expertise lies in the field of literary criticism and theory rather than history makes the challenge all the more daunting. Adolf begins well enough with a discussion of peaceful traditions and practices in primitive human societies. He refers to scholarly studies such as Frans de Waal’s ‘Peacemaking among Primates’ (1990) and argues that cooperation and mutual support were important, if not dominant, in early human societies. He does not analyze the transition to hierarchal and violence-prone empires, but only questions “the assumption that warfare is inevitable in state formation” (p. 31). He identifies positive contributions in Mesopotamian and Egyptian civilizations as the development of law and peace treaties, but says little about the militaristic orientation of these societies, which was chiseled into stone. In discussing Classical Greece, Adolf searches for peace traditions and influences. He appropriately identifies the “Olympic peace tradition” (p. 39), but stands on shakier ground in citing Homer’s heroic war stories, the Iliad and Odyssey, as contributions to “conditions of peace and peacemaking” (p. 36), and writing that “Sparta and Athens and the leagues they supported continue to provide competing, contrasting peace paradigms” (p. 35). Adolf attaches the word “peace” to many questionable entities and developments in the first half of his book, giving the impression that civilization is progressing in fits and starts toward peace. Roman stoicism is said to be a pacific principle (p. 52); the decline of the Roman Empire is described as “a fusion of Roman and Germanic peace traditions” (p. 104); and Niccolo Machiavelli is said to have “pioneered a perspective on political peace and peacemaking now called realpolitik” (p. 117). Lacking a clear definition of peace, Adolf employs the label idiosyncratically. There are also notable imbalances. For example, in his chapter on the great monotheistic religions, he recognizes Christian monasticism and sainthood as “Christianity’s most influential contributions to peace in the Middle Ages” (p. 108), but says nothing about the Church’s murderous repression of heretics; nor, on the positive side, the agonizing development of religious toleration in Europe. Adolf stands on firmer ground in the second half of his book, marked from the Peace of Westphalia in 1648. In Chapter Six, he explores the contributions of European philosophes in the formation of democratic societies, the work of legalists such as Hugo Grotius in proposing international security institutions, the development of nongovernmental groups such as the International Red Cross, the creation of peace societies in Europe and the U.S., and the works of peace advocates such as Leo Tolstoy. All of these are essential components of peacemaking and it is unfortunate that they are packed into one chapter, such that analysis, nuance, and historical contextualizing are limited. We are told that “Belgian King Leopold II hosted the 1894 Universal Peace Congress in Antwerp, indicating support for the cause” (p. 138), but not how Leopold used such conferences to deflect attention from his ruthless imperial operation in the Congo. Similarly, we learn that Theodore Roosevelt mediated the Russo-Japanese War, but nothing about his “big stick” interventionist policies or imperious views, which had the larger effect on shaping United States foreign policy and ideology. Discussion of peacemaking in the twentieth century is divided into two chapters. Among the developments discussed are the Hague peace conferences of 1899 and 1907, the League of Nations and United Nations, peace leaders such as Mohandas Gandhi and Mikhail Gorbachev, peace writers such as Bertrand Russell, Jane Addams, and Simone Weil, peace actions such as conscientious objection to war, and peace organizations such as the Women’s International League for Peace and Freedom, the American Committee for Non-Violent Action and SANE, the British Campaign for Nuclear Disarmament, and the German Green Party. These chapters may well impress students unfamiliar with the terrain, but are unlikely to awe scholars, as there is no new research or insights and few references to academic studies and interpretive debates. The contributions selected favor the West, the United States in particular, and world order schemes over other peace themes. There is little discussion of anti-imperialism or the connection between peace and progressive activism. In separate chapters on economics and globalization, Adolf discusses theories of capitalism and socialism, without reference to practice, and gives them equal weight as vehicles for peace. He does not explore the connections between capitalism, imperialism, and war drawn by socialist critics such as John A. Hobson. Unlike many progressive peace advocates who view globalization with alarm, Adolf sees the diminution of national governments vis-à-vis corporate capitalism as an opportunity to empower the United Nations and its peacekeeping mission. He is right to do so, but his hopeful analysis fails to address the growing power and reach of global capitalism, as described by Antonio Negri and Michael Hardt in ‘Empire’ (2000). In his last chapter, Adolf sets out a number of criteria for positive peace, including “full and free employment” and “reduction of wealth disparities,” but does not connect these goals to the rich tradition of socialist analysis nor specific agents of change. Despite these limitations, Adolf is to be commended for writing a unique study that looks at a vast amount of history from the point of view of peacemaking. There is a need for such ethically centered studies that address the big picture. Others of like mind will surely build on this study. Roger Peace: Rezension zu: Adolf, Antony: Peace. A World History. Cambridge 2009 , in: H-Soz-Kult, 15.01.2010, <www.hsozkult.de/publicationreview/id/rezbuecher-13085>.